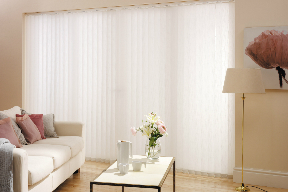 Vertical blinds at Houston Blinds For Less are the traditional choice for sliding patio doors and large windows. With a wide variety of styles and materials to choose from, including wood, faux wood, smooth PVC, plastic and fabric, custom vertical blinds are ideal for almost any décor that requires a functional yet stylish window covering. Whether you are looking to improve elegance, light control or a lovely view, vertical blinds are the versatile solution for large windows and sliding doors in your home or office. 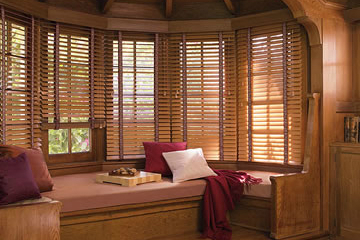 If you’re just seeking replacement slats or vanes, Houston Blinds For Less can help. We cater to all of Houston and the surrounding cities. Contact us today to schedule a free consultation. Popular vertical blinds at Houston Blinds For Less include 3 ½-inch faux wood vertical blinds, fabric window blinds, smooth and textured blinds and real wood vertical blinds. Houston Blinds For Less can help you determine the best blinds for your home or office, depending on what you want to accomplish, your preferences, décor and budget. Custom faux wood vertical blinds at Houston Blinds For Less give you the look of real wood with the easy cleaning and maintenance of PVC. Also called Vertical Plastic Blinds and Composite PVC Blinds, faux wood vertical blinds are durable and don’t warp or crack due to humidity. Fabric window blinds for patio doors and wide windows offer the best solution for controlling your privacy while adding elegance to your room. These custom vertical blinds are available in a wide selection of fabrics and patterns. Smooth and textured vertical blinds for sliding glass doors and large windows have curved slats for superior light blocking. 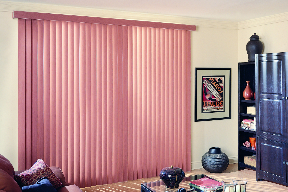 Available in a variety of colors and textures, these vertical blinds will be a stunning addition to any room. 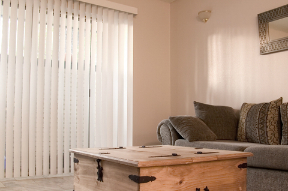 Custom wooden vertical blinds at Houston Blinds For Less add a sleek, contemporary styling to any room. Crafted using beautiful Basswood, wood vertical blinds are available in various stains and shades of white. Call (281) 997-2100 or contact us today to schedule a free consultation. If you can’t stop by the Houston Blinds For Less showroom in Pearland to see our wide selection of vertical blinds, we’ll bring the showroom to your Houston area home or office. Houston Blinds For Less serves Houston and surrounding cities including The Woodlands, Galveston, Spring, Cypress, Katy, Missouri City, West U and more.